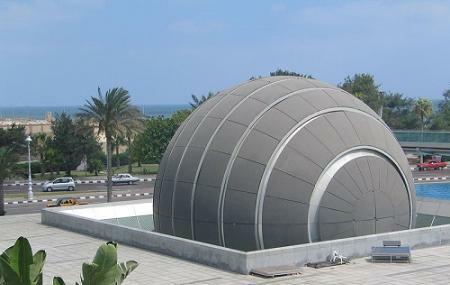 Tucked within the Alexandria Public library, El Kobba El Samaweya is an interesting Planetarium featuring state-of-the-art projection technology. Lose yourselves to the fascinating science shows which are both entertaining and informative, observe the universe in close distance with the functional kaleidoscope, and experience the feel of flying through space and time with the help of Digistar 3 system. Loaded with a lot of surprises, El Kobba El Samaweya is a great place to visit and also has an IMAX screen. The nearest station is El Raml Station. Alternatively, you can also rent a car or hire a taxi. How popular is El Kobba El Samaweya? People normally club together Grand Trianon and Bibliotheca Alexandrina while planning their visit to El Kobba El Samaweya. A little pricy for what it is but imo a great experience that keeps you engaged the whole time. Think imax for ancient egyptian history but a with a wider field of view. If you don't speak Arabic be sure to ask for the English audio headset or you won't understand anything. All in all well worth the visit. It's a very good experience with fantastic movies and magnificent atmosphere. The only problem is that no entry for children less than 6 years old. I totally recommend the shows for kids and adults also. It isnt planetarium, its simply a cinema theatre. I paid fees but didn't see any planet,I didn't see the viewing equipments either.when I asked I was told to pay for another show. Dont waste your time and money to go there. For kids it's ok, but presentation method is old fashioned and the picture is a little out of focus and not over dimmed. All who watched the movie where a little dizzy after the show.